Our third recording, reflecting the variety of jazz that we do - classic Dixieland, 1930's and 1940's Swing, harmonized vocals, and fun novelty tunes. Hello friends and fans - Jim Ziegler here. Well, it's been a long time coming, and we've gone through a few changes, but we're back and Still Swingin'! I hope that you enjoy this collection, which is a great overview of the many kinds of jazz that we do - from the Classic 1920's era on through 1930's and 40's Swing. There's something for everyone here, and my hope is that you'll be entertained, enlightened and uplifted all at the same time. I'm especially happy to present a tribute to my former bass player and vocalist Lee "Westy" Westenhofer by singing "I Believe In Miracles", a wonderful tune from the 1930's that he sang with me for many years. Phil Krawzak on tenor saxophone and clarinet and Tom Hynes on guitar are still with me from our last recording and perform beautifully throughout. New additions to the band since my last recording are Bryan Taylor on drums and Dave Eastly on bass and vocals. Dave sings "Dinah" and "Sentimental Journey" here, with some harmonized vocalizing by yours truly. You'll hear some three part harmony on a few tunes ( myself, Dave, and Phil Krawzak on clarinet ), which is something that is unique to my band - I hope that you enjoy it! Also there is a great variety of eras and moods here - from beautiful ballads to swinging up tempos, from 1915 "Jelly Roll" Morton to 1948 Thelonious Monk ( yes, Monk - I really feel a lot of his tunes would work great at swing dances ). I'm so very proud of this effort, and I thank you for your support. Happy listening! We really enjoy every song on this cd! It is a fun mix ! My favorite is 'I lLike Bananas Because They Have No Bones'! Jim Ziegler has the most amazing voice that is just made for these songs. 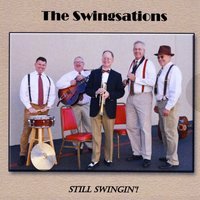 The Swingsations all do an awesome job on every track.